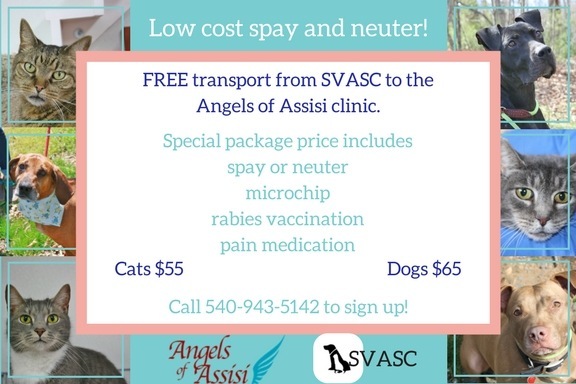 Each month our shelter hosts a spay/neuter transport to Angels of Assisi in Roanoke, VA, for cats and dogs. An appointment must be reserved with our shelter so that we can make sure there is room on the van. Animals will need to be dropped off at our shelter by 7:00 am on the morning of the appointment and pick up is around 6:30 pm the same day. All cats must be in a plastic crate to go on the transport. If you do not have a crate, please try to borrow one or ask the shelter if there is one you may borrow. Feral cats must be in traps. The current price is $55 for a cat spay or neuter. This also includes a rabies vaccination, microchip, and pain medication. It is $65 for a dog spay or neuter and also includes a rabies vaccination, microchip, and pain medication. Cash or check is accepted and checks are to be made payable to the Shenandoah Valley Animal Services Center. If you need financial assistance to have a pet spayed or neutered, please call the shelter. Financial assistance is sometimes available to assist with the costs of the surgeries.